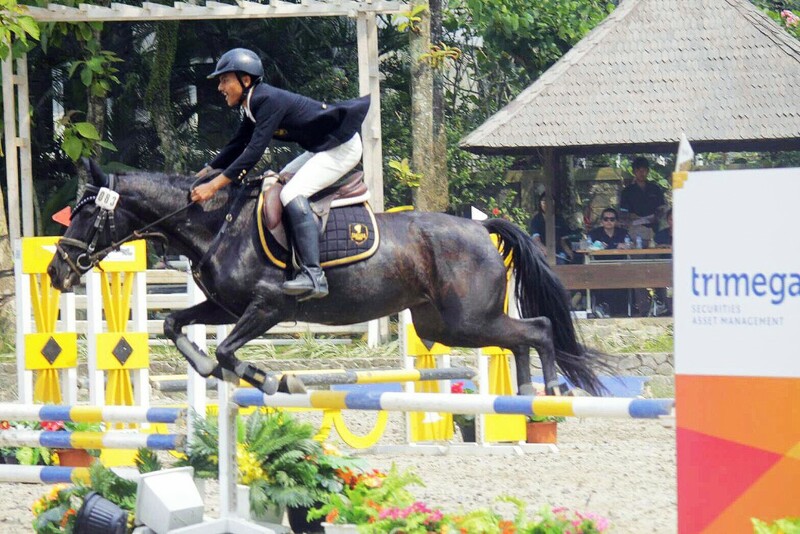 There are four main types of showjumping classes: equitation, hunter and working hunter, speed, and jumper classes. Within these classes is a range of heights and levels of difficulty. There are special classes restricted to either novice or more advanced riders. In addition, there are novelty classes. For instance, a mirror track is where two riders race against each other over identical courses. Another interesting class is a six-bar competition, in which you jump a line of six fences, each two strides apart, with the fences getting progressively bigger. Originally designed for young riders, there are now an increasing number of these classes for adults. They are designed to judge the rider, not the horse, but it is a mistake to think that what is required is just a beautiful rider. Every rule about a rider’s position has a reason, and effectiveness is made possible by a good position. Courses are designed to test the ability of the rider, with different options regarding lines and stride lengths. Equitation classes are an excellent grounding for those who wish to compete later on over bigger fences in the jumper classes. At some competitions, an outline of the course is sent to riders in advance. This gives a focus to training and encourages quality work. In these classes the horse is judged. Courses tend to be straightforward and are designed to show the jumping ability of the horse rather than the rider. In practice, though, the horses that are ridden by the best riders tend to perform the best, which once again emphasizes the value of good riding. These classes seem to be the opposite of hunter classes. Judged on speed in the first round, they often require dramatic changes of direction and pace, as well as inventiveness from the rider in finding the shortest routes. However, the basic requirements for success are the same as in hunter classes: correct flat work and a horse that really tries hard to jump cleanly. Unlike a hunter, a speed horse tends to be short striding. This allows him to go faster in related distances without exceeding the 12-ft (3.7-m) stride lengths. It also enables quicker turning. In these classes, clear rounds are the priority. The height of fences ranges from 2 ft 9 in (90 cm) to 5 ft 3 in (1.6 m) at Grand Prix level. The novice classes tend to have either no jump-off or an immediate jump-off round, which is not against the clock. In the latter, you actually jump two courses one after the other, so it is a memory test for the rider. After novice level, classes tend to have one jump-off round against the clock, although some do have two rounds, with only the second one against the clock.